It seems like every time I go to the store I find something new! Well something that’s new to me anyway. I like to pop into a grocery store that I don’t normally shop in just to see what they carry verses my regular haunts. Usually I find something interesting which I am happy to share with you today! When I was in the local Raley’s grocery store I found these little snack packs in the Health Food Aisle. They are crunchy and tasty! I’m already a fan of zucchini and these little crunchy bites were super fun. Only 30 calories for the entire bag, no added fat, sugar or salt. There were many different fruits and vegetables to choose from but I only came home with these two. I loved the pineapple and only 45 calories for the whole snack bag! I need to go back and get some more. They were pricey but would make a nice travel or hiking snack. Check out the Snapz site for where you can buy them locally. To my family and friends in the Midwest HyVee grocery stores are on the list as well as some Subway stores! A nice alternative to chips. Sometimes you just want some crunch! We try to have one meal a day be a giant salad with beans. To keep it interesting I buy a lot of different what I call salad mix-ins. Any of these can be cooked but we usually enjoy them raw added to a bowl of organic baby greens, spinach and kale. We love the crunch of the broccoli slaw plus it adds color. You can use it as a base for a slaw with apples and a dressing too. Have you tried raw Brussels Sprouts? Think about it, they are little cabbages and we eat raw cabbage in slaw. I have been slicing my own fresh Brussels sprouts but when I saw these already sliced ones at Trader Joe’s I snatched them up! I like easy. They add a nice flavor and more crunch to the salad. Sugar snap peas are good all on their own or as little dippers for hummus. Slice them in thins strips the long way and toss them into your salad – they have a slightly sweet refreshing flavor. I like to take a baggie of them to the movies. The rainbow salad is similar to the broccoli slaw but it also red cabbage and little bits of broccoli florets. It can be tossed in with your greens, added to a soup or stir fried. It came from the regular grocery store. The other items came from Trader Joe’s but most grocery stores carry their own versions of the same thing. These are great for wraps like the Samosa Wraps or for burritos. Warm them up in the microwave so they roll easier. They do contain some oil and salt but I have yet to find an oil free,low sodium one that has a nice texture and flavor. 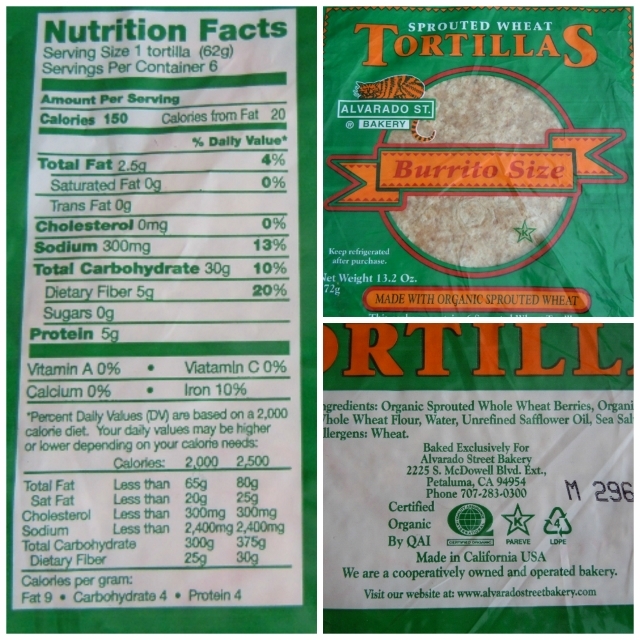 If you have a favorite whole wheat or whole grain tortilla feel free to share what brand you like in the comment section. These can be found at Trader Joe’s in the bread section on the bottom shelf. The Farmer’s Market here goes all year long – I know we are very fortunate. 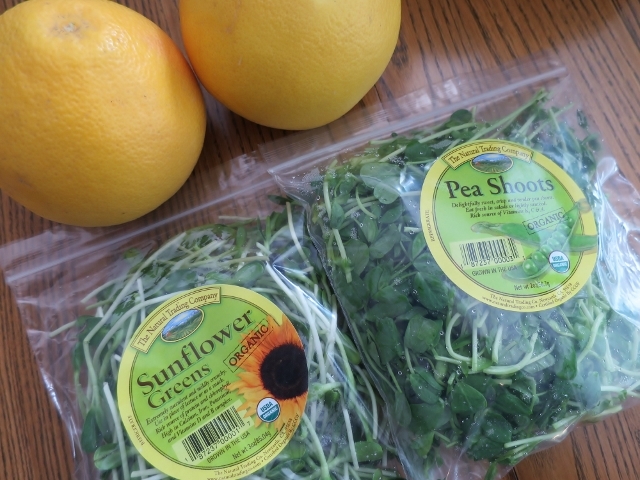 The choices are indeed fewer this time of year but this week I came home with freshly picked grapefruit and Sunflower Greens and Pea Shoots. They are a nice addition to salads, wraps, on top of veggie burgers or tossed in a stir fry. Of course many of the farmer’s had a variety of squash, greens and citrus but I already had plenty of those. 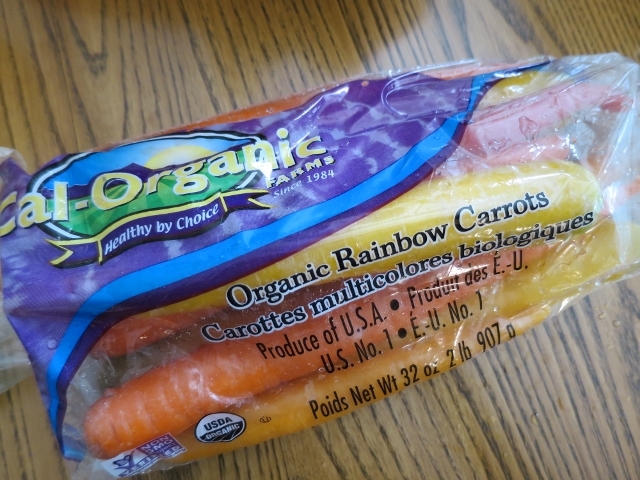 These colorful rainbow carrots had to come home with me from Whole Foods! Yellow, orange and even red carrots – I know, how cute are these? I can’t decide if I want to toss them into a soup or if I would rather eat them raw with some hummus. Imagine how pretty they would be on a raw veggie platter. I hate to sound like the weather lady but I am happy to report that after 52 days of no rain we finally got some of the wet stuff yesterday and last night! We are in a drought situation here with water restrictions in place so rain is a welcome sight! More on it’s way today – woo-hoo! We are doing the happy dance. I have been cooking up a storm this week. If you follow me on Instagram you have seen some photos of my efforts in the kitchen! 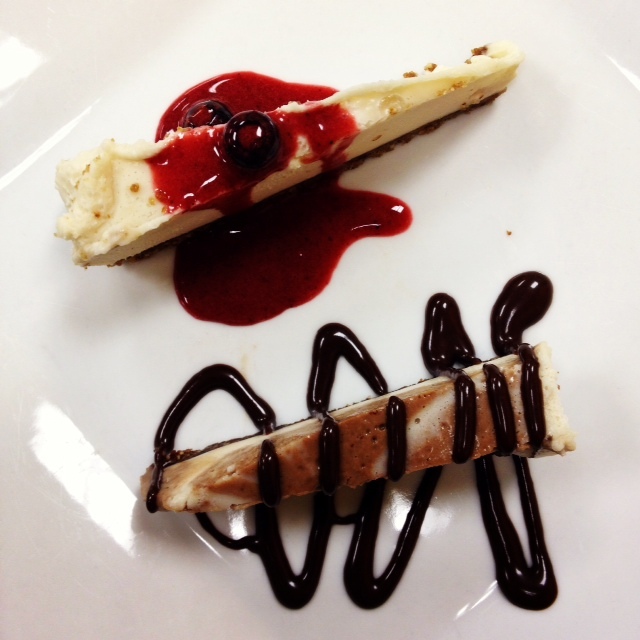 I took another cooking class at a local vegan restaurant this week and learned how to make raw dairy free cheesecakes! Of course tasting was involved and they are amazing. No one would know they are vegan, raw and dairy free as they are decadent! Raw just meaning they don’t require baking! The top one is a traditional cheesecake flavor with a nut crust that tastes a lot like a graham cracker crust and it’s topped off with a berry sauce. You can make a berry sauce with frozen fruit and agave nectar The other slice has a fabulous chocolate nut crust with a chocolate swirl filling, garnished with a homemade chocolate sauce. Who knew a chocolate sauce could be made with maple syrup and cocoa – yes it’s that easy. Put it in a squeeze bottle so you can do fancy designs. Much easier than making a traditional baked cheesecake and the sauces are super simple. We were taught little tips and tricks to make the desserts look professional as well as plating techniques. I loved every minute of it! I have taken two vegan cooking classes and both were well attended. People are really wanting to learn how to cook healthy vegan meals. When I get better at cooking vegan myself I think I might like to teach some classes! That’s whats happening in my corner of the world. Thank you for taking the time to read this post! Thanks for following me on this journey into the world of eating a plant based diet. We can learn from each other along the way. It makes me happy when you leave a comment – won’t you make me smile today? 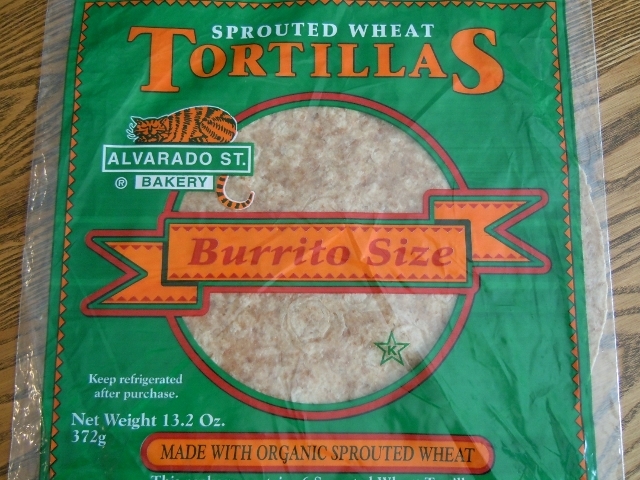 Do you have a healthy no or low oil, low sodium whole wheat or whole grain wrap or tortilla you can share the name of? Have you ever tasted a raw vegan cheesecake? I love all your food finds Tami! My recent favorite “tortilla” is actually a Flatout – it’s long and rectangular and it’s only 140 for the whole thing – great for pizza for one! 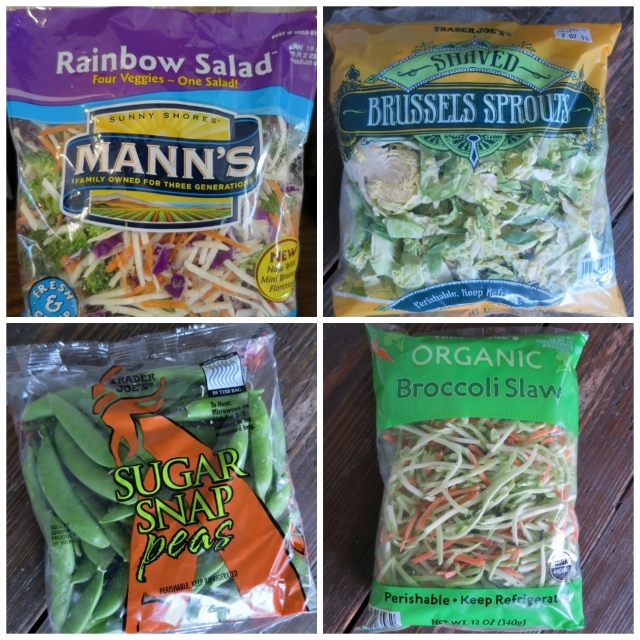 And I love broccoli slaw – I love adding it to stirfrys – less chopping! I’ve never heard of Sunflower Greens & Pea Shoots! They look awesome! The little greens are so much fun to add to salads and wraps! Look for them at your local farmer’s market! Great food finds! I love all the colorful carrots that are showing up everywhere! Those crispy healthy snacks are soo cool! And I love sugar snap peas as a crunchy snack – great idea taking them to the theater. And that would be so neat if you taught vegan cooking classes!! I like Joseph’s Pitas to make pizzas with. I haven’t had raw cheesecake. I don’t even eat regular cheesecake very much. Funny – I do love desserts, but I can take or leave cheesecake. I do want to make you smile today! I have read your blog for years now, I love it! I did try to post a comment a couple of years ago, it did not work, I’m not tech savvy at all. I have not embraced a vegan diet, follow Weight Watchers Simply Filling many of your vegan recipes fit into the plan. I just made your breakfast cookies, yet another successful “Nutmeg Recipe” success. You are a legend in my house, my husband and 6 year old daughter will often say at the dinner table…that was good, is it a Nutmeg recipe? Thank you for keeping all your non plant based recipes, still finding new ones in the archives. I am humbled and delighted to know that you and your family enjoy the recipes I post here. You have no idea how much joy it brings me to think my work on this blog is helping someone put a healthy meal on the table to share with their family! Thank goodness leaving a comment worked for you this time! The plant based recipes can fit into anyone’s food plan and they offer an economical meatless choice to shake things up! I hope you will continue to comment from time to time and let me know you are still reading. Tell you family I said hi! You’d make a great cooking teacher! I found those colored carrots before Christmas and they are so fun to serve!